Chi ha detto che latino e computer non vanno d'accordo? Un efficace connubio tra la lingua antica e il modernissimo pc è documentato dall'undicesimo numero della nuova serie della rivsta Aevum Antiquum, diretta da Mario Cantilena. Il fascicolo si divide in due sezioni. Mentre la seconda, intitolata Convivium, ospita 4 lavori di vario tema letterario - da Esiodo a Bacchilide, da Lucano a Curzio Rufo - la prima sezione, il Forum, è dedicata invece al tema unitario Tecnologie moderne per le opere degli antichi, con otto lavori di vari autori. 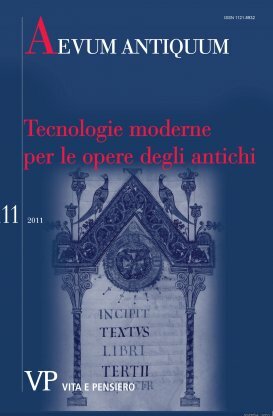 This essay examines the electronic instruments that are available for research on the texts of late Latin antiquity, with a focus on the project Digital Library of Late Antique Latin Texts (digilibLT), developed by the University of Eastern Piedmont and the University of Turin and dedicated to the prose works of profane content dated between the II and VI century a. D. The essay serves as a methodological introduction to the following collection of interventions, which were read in a congress on the initial results of the digilibLT project held in Vercelli in November 2011. The collection, nevertheless, was deeply revised so to underline how the new technologies can be integrated with old, consolidated methods of research based on ecognized paper repertoires of texts. This paper intends to contribute to the functional description of the discourse particle nam. For this purpose, a detailed study and an accurate description of the presence and the use of nam within Cetius Faventinus’ Adbreuiatus liber is presented. This brief work is particularly suitable for the analysis of discourse particles for two reasons: owing to its nature as a technical treatise, it deals with a simple and rational type of discourse, and, on the other hand, in so far as it is basically an abridgement of Vitruvius’ De architectura, the direct reading of Vitruvius can help to resolve possible semantic ambiguities or uncertainties in Faventinus’ text. The first part of this essay individuates the recurrence of connectives such as nam, enim and namque in the works about Alexander the Great of the IV century a. D., basing upon the database digilibLT. A deeper analysis of the use of nam in the Itinerarium Alexandri places the particle in its contexts. The second and last part focuses on -que abundans and pleonasms in the Itinerarium Alexandri. The essay marks thus a distinction as to what kind of analysis are allowed by the database and what, on the contrary, it cannot reach to. Informatics tools such as digital library and search engines may offer useful instruments to re-examine the ancient commentaries on Vergil and perhaps give them a fresh asset. This paper discusses two examples of this necessity with the aim of demonstrating the utility of informatics technology and its effective use in the field of Classics. The first example regards three comments on Aen. X 5-10; the second involves the use of a lexical search engine (in Tiberius Claudius Donatus's comment on Aen. XII 297). This paper analyses the epitaph of Ennodius, in order to show how and how much his portrait resembles the representations of both holy bishops and himself drawn by Ennodius in his writings. The commentary aims to detect the influence of Ennodius’ poetic language and style as well as the echoes of Latin literary tradition, deals with the exegetical difficulties resulting from the obscurity of some expressions, and discusses the questions related to the possible authorship of the poem. A digital edition needs several steps, from definition of the critical edition, on which the digital text is based, to xml encoding. The paper focuses on some methodological issues referring to text acquiring, editing and xml encoding; furthermore it analyses how the Digital Library of Late-Antique Latin Texts (digilibLT) tries to answer to these open questions. The making of a digital edition of a late-antique Latin text requires both digital humanities skills and a good knowledge in Latin language; this topic is analysed in the paper.